Your smartphone may be the center of your world, the most fantastical, incredible feat of engineering to ever grace the palm of your hand … but is it a work of art? We're much more comfortable slapping that label on some phones than others, and personal taste will always differ. For Google's latest Nexus accessory, the company's making that conversation a lot simpler by bringing on an internationally acclaimed artist, as it introduces its new Jeff Koons-designed Nexus Live Cases. Google first teased the new cases yesterday, as well as revealing Koons's involvement, and while we knew we'd be looking forward to some exclusive Live Cases for Nexus phones, we didn't have much in the way of detail at the time. 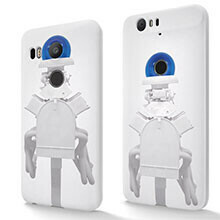 The new Koons line of Nexus Live Cases consists of three designs, each available in variants for both the Nexus 5X and Nexus 6P. The three looks marry images of monochromatic sculptures with a burst of color in the form of the reflective blue “Gazing Ball” featured prominently in other Koons works. For Nexus 5X designs, that Gazing Ball surrounds the phone's rear camera, while for the Nexus 6P Google slides things down a little, positioning the Gazing Ball instead around the phone's rear fingerprint scanner. That makes the artwork a little on the smaller side with the 6P, but at least you don't have a fingerprint scanner obscuring part of it, like on the 5X. As we're familiar with from existing Live Cases, these Koons designs feature a software-configurable button ready to help quick-launch your favorite app. They'll also come with access to an interactive Swan Lake wallpaper, and connect owners with future Koons art pushed right to their phones. All three designs are limited-edition runs, and while Google hasn't said just how many will be made available, don't expect these cases to last forever. Sales are open now, with all options going for just $40. strippers are dancers , dancing is art , i want live stripping case on my phone.